​Hi! Andrea Hardy, registered dietitian at Ignite Nutrition here! Joanna kindly invited me to share my expertise on the gut microbiome for you, and I’m really excited to discuss something I’m very passionate about – gut health. Many times, patients come to me having tried the low FODMAP diet, since it’s becoming more mainstream. Some are successful, and are struggling with reintroduction, whereas some are not successful, but are still often following an unnecessarily restrictive diet. 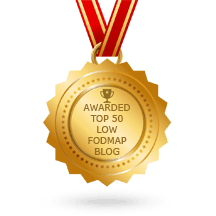 The low FODMAP diet is meant to be a short term diet, between 4-12 weeks, followed by strategic reintroduction to add FODMAPs and variety back in to your diet. I like to explain that the low FODMAP diet is like a ‘bandaid’ solution. It helps us to get your symptoms under control, understand the underlying problems, and identify what amounts of FODMAP’s you may tolerate. As you may know, FODMAP’s are fermentable carbohydrates. When they reach the colon, bacteria in our colon break them down, and produce gas – often triggering IBS symptoms. However, what we often forget is when the bacteria break down FODMAP’s, they’re also producing crucial by-products that are essential to not only gut health, but overall health. Research shows, patients that stay on a low FODMAP diet too long have a depletion in many important bacteria, especially our bifidobacteria – a type of bacteria responsible gut health. I like to say bacteria are ‘picky eaters’. Different bacteria like different fuel sources. Due to the lack of variety, and lack of adequate fuel on the low FODMAP diet, bacteria can decrease in abundance, as well as variety. When it comes to the microbiome, we know a healthy microbiome has a larger variety of species, and a greater abundance of bacteria. 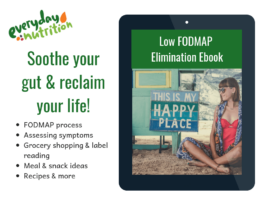 Persisting on the low FODMAP diet could potentially contribute to dysbiosis (an imbalance of bacteria), and the longer you wait to reintroduce, it may be harder for your microbiome to bounce back to ‘eubiosis’ – or a balance of bacteria. As well, this may harm your microbiome. When bacteria are well fed with fermentable carbohydrates, they produce beneficial by-products. These by-products include ‘short-chain fatty acids’ – and they fuel your colon cells, help to produce a healthy mucous layer in your colon, and have anti-inflammatory effects on the body. When bacteria aren’t well fed, they need to find fuel from another source. They could break down proteins, however the by-products from protein digestion are more pro-inflammatory. Or, they may start to digest the important mucous layer, your first line of defence against pathogenic bacteria, and undigested food molecules getting through to your gut lining – which could trigger inappropriate immune responses. 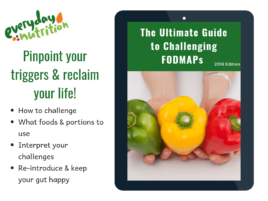 Reintroduction and re-challenging FODMAP’s is critical to ensure that you feed those gut bugs and keep them happy and healthy. I find that including FODMAP’s is a bit of a balancing act. It’s not an all-or-nothing thing – including small amounts of the FODMAP’s you tolerate throughout the day can help to ensure you fuel those gut bacteria. As well, timing those FODMAP’s on days you’re less stressed, are able to get a bit more exercise, or are feeling a bit better are great days to ‘challenge’ your gut bacteria and tolerance. For example, the FODMAP’s I found that bother me through reintroduction are lactose, and mannitol. I choose to include both most days, however near my menstrual cycle – a big IBS trigger for me, or when I’m more stressed, I have to reduce the amounts I consume. As well, I do have to be cautious with the volumes. I can include some amounts – however I LOVE my mushrooms. I can tolerate a generous portion on the first day, however, if I consume the leftover multiple days or for multiple meals, my symptoms can flare up. I’m cautious to have two big ‘mannitol days’ back to back, or if I choose to do that, I ensure it’s not at a time in which my gut is a bit more sensitive. Now – this is a bit complex -and working with your dietitian can help you to problem solve and find the right amounts for you. It will be trial and error, however your microbiome will thank you!